Alas, you’ve found the perfect diamond with a well-seasoned 4Cs! The last thing you need is a ring setting to complete your engagement ring. You’ve chosen a design you like and unconsciously clicked “white gold” as a ring metal in the selection because that’s the most common one. And at this point, it wouldn’t matter what ring metal you get anyway, right? Well, not really! Most high-end jewelry that you can find will usually come along in one of the ring metals above. Each one has pros and cons in terms of durability, matching the skin type, and allergic reactions. It’s not just gold or silver anymore! The engagement ring metal greatly contributes to the brilliance of the diamond and the aesthetics of the wearer. So, what's the best metal for engagement rings? Let's have a closer look! Yellow Gold is the king among the gold types. Although white gold ruled the market for a while, yellow gold is back on the throne. It has precisely the kind of glorious color that you think of when hearing the word gold. The purest one (24 Karat) is too soft and would easily get scratches and deformations. This is why gold rings are usually mixed with alloys such as zinc or copper. Most gold rings are made of 14K gold (58.5% gold content) or 18K gold (75% gold content). I have explained in another post on gold purity why 14K is the most desirable. 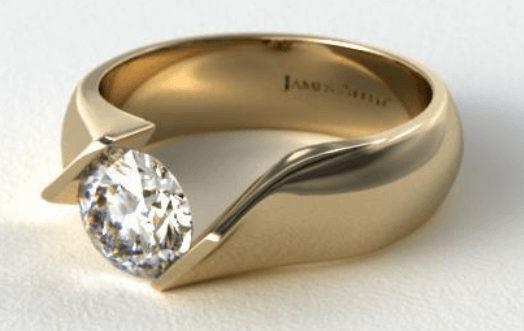 In fact, nearly 90% of all gold engagement rings and wedding bands are made out of 14K gold. Thing is, yellow gold is not as durable as white gold as there's a different alloy mixture contained. So, a 14K yellow gold ring will show marks of wear and tear quicker than a 14K white gold ring. Since yellow gold is the purest form of gold, it is also associated with success and winning. This is why the winner in any competition gets a yellow gold medal. It’s also the most hypoallergenic of all gold metals, so it usually causes fewer allergic reactions. Yellow gold ring settings also have the advantage that you can tone down the color quite a bit. As a diamond picks up quite some color of the ring setting, you would not really be able to see a difference between a D-colored and an H-colored diamond mounted onto a yellow gold ring setting! Another factor that’s usually overlooked is the compatibility of the ring metal to the skin tone. Yellow gold rings beautifully suit darker or olive-colored skin tones while they don’t go well with pale or rosy skin. You might want to have that in mind when choosing a ring metal! This lighter variety of gold had its fair share of spotlight in the recent years and is still the best choice for most women especially in the United States. It’s cheaper than platinum and on par with yellow gold as far as the price is concerned. White gold consists of pure gold and is mixed with other alloy metals. These are usually silver, manganese, palladium, rhodium, and nickel. Therefore, white gold does not exist on its own. It can usually be bought as 14K (58.5% gold content) or 18K (75% gold content) rings. As already mentioned, a 14K white gold ring will be more durable than a 14K yellow gold ring due to the different alloy metals. Because of the nickel that is usually contained within white gold, it has the largest tendency to cause allergic reactions. 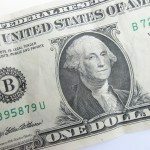 If you are among those people, you have to make sure that the white gold you are buying does not contain any nickel. 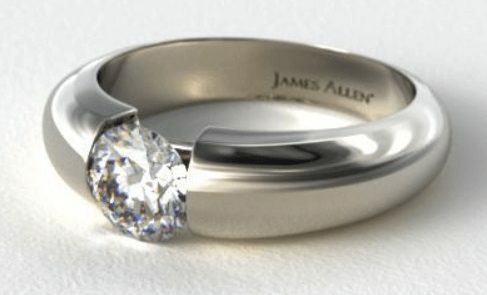 It will be harder to find, but white gold rings without nickel but have palladium instead can be found as well. And the latter doesn’t cause any allergic reactions! If you have difficulty finding a white gold ring without nickel, platinum can be a good alternative. These days, it’s not that much expensive compared to white gold as it used to be. White gold rings are usually rhodium plated. Rhodium itself is used as a plating because it has a dazzling, flashy chrome-like appearance! Among all metals, it has the most pronounced reflective properties. As rhodium on top of a white gold ring setting sparkles quite heavily, it is difficult to tell where the diamond ends and the metal begins from a couple of feet away. Given it’s a plating, it will wear off with the usual wear and tear and will require reapplication every 6 months or so (depending on usage). This can be done at every local jewelry store for a little money. Here’s a pro tip: If you are buying a ring for a person with lighter skin tone and don't want to pay that much money for platinum, white gold might be the best choice for you! Rose gold rings have been in-demand recently mainly for its pinkish color that exudes warmth and romance. It’s also referred to as pink gold, red gold, and Russian gold as it used to be coveted in Russia in the 19th century. 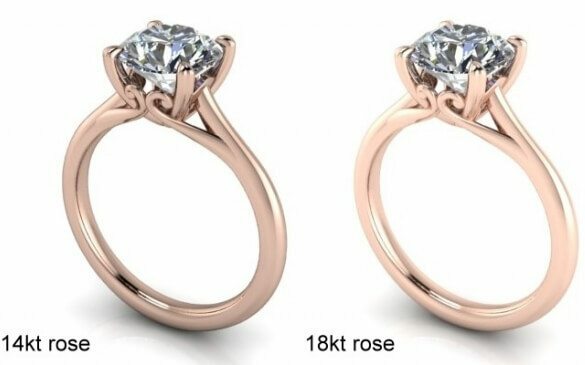 When it comes to pricing, rose gold can be slightly cheaper than yellow gold or white gold as the alloy used in rose gold (copper) costs less. Rose gold has the advantage of being more durable than white or yellow. Unlike white gold, rose gold will continuously maintain its shiny appearance for a lifetime. Therefore, no alloy reapplication is necessary. Plus, it has no tendency to tarnish! One thing to bear in mind though is that the copper in rose gold rings can cause allergic reactions. So, you would have to make sure that the wearer isn’t allergic to copper. All in all, rose gold is an excellent choice if you’re looking for something unique, feminine, or romantic! Platinum is the most expensive ring metal. It’s naturally white and has a sleek luster that can elegantly exhibit the diamond’s sparkle. Platinum rings must consist of at least 95% platinum. Otherwise, it would merely be considered a platinum alloy. It’s rarer than gold and very durable but not as expensive. Since it is denser than gold, more platinum is required to make the same ring setting. Also, a platinum ring consists of 95% platinum as opposed to a gold ring that only comprises of 58.5% gold (14K ring) or 75% gold (18K ring). This drives the prices of platinum rings up quite heavily! 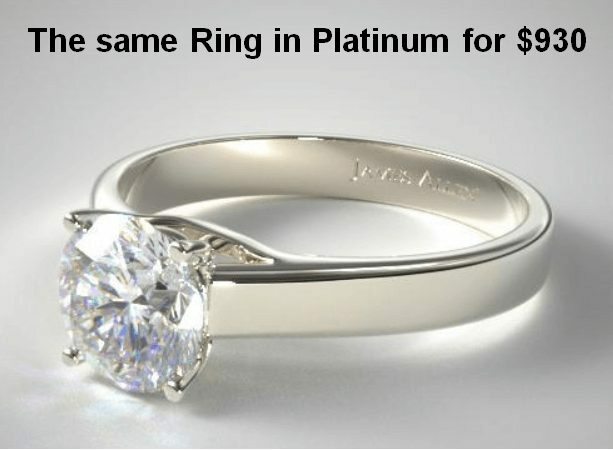 The price for the platinum ring is nearly double the amount compared to the 14K white gold ring setting! In fact, this is why platinum is associated with higher status than pure gold. The best seats in large seminars are called platinum seats and the second best are called gold seats. Likewise, a platinum credit card has a higher status than a gold credit card. 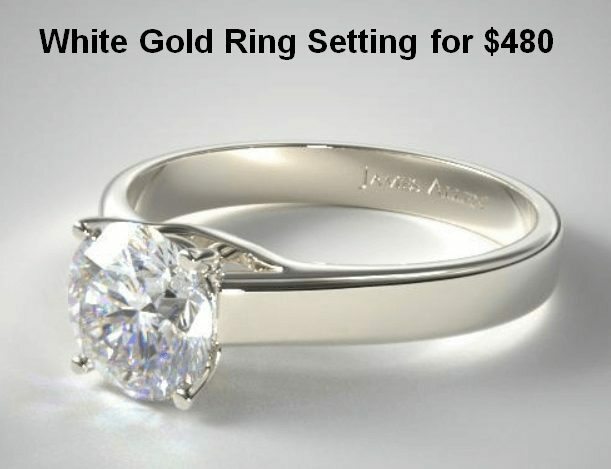 As you can see, however, it is tough to distinguish between a white gold ring and a platinum ring. Basically, it’s impossible to differentiate between the two just by looking at them! Platinum has the advantage of being hypoallergenic: It does not cause allergic reactions. But that is not the entire story. Although platinum is a very durable metal, it tends to get dull and scratched over time even more than white gold. Therefore, regular repolishing will be required every few years. All in all, platinum is a great choice if you’re allergic to white gold. Other than that, white gold is less expensive and requires less care. So, I think for most people, white gold is a better alternative. What’s the Best Engagement Ring Metal for Her? So, you’ve picked the one that’s within your budget, as wells as a color that will match her skin tone and won’t give her a rash. But most importantly, does it suit her style? A certain ring metal might look good on her skin tone, but if she’s wildly into a specific jewelry color, then you would have to take that into consideration as well. You can also mix metals so it will be easier for her to match the ring with other kinds of jewelry. If she sticks to the classic or doesn’t have a unique preference, then you can just follow the guideline above. Start your search with James Allen ring settings! They have a massive variety of around 500 different ring settings. 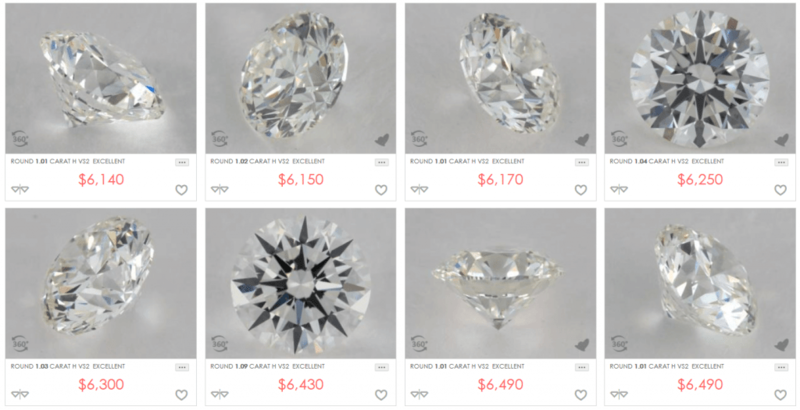 They’re my current favorite when filtering diamonds as you can view all the stones in high definition 360° videos in up to 40x magnification! Even if she’s part of the picking process or has virtually revealed to you what she exactly likes, it’s always fun (and challenging!) to choose an engagement ring for your lady. You’ll be surprised at how there’s still something you don’t know about her. Sure enough, buying the right diamond, ring setting, and ring metal that didn’t burn your wallet is an experience one for the books. And the next chapter – the proposal! What's the Best Engagement Ring Metal in Comparison? Hi, I bought a rose gold ring a couple of months ago. Even though it hasn’t been long, it’s quite tarnished already. It is dull and has turned yellow and black. It is no longer rose gold. In your article you state that “Unlike white gold rose gold will constantly maintain its shiny appearance for a lifetime. Therefore no alloy reapplication is necessary. Rose gold rings also have no tendency to tarnish.” So what do you think is wrong with my ring? Would the “best bang for your buck” colors of yellow gold K-M apply to rose gold rings? 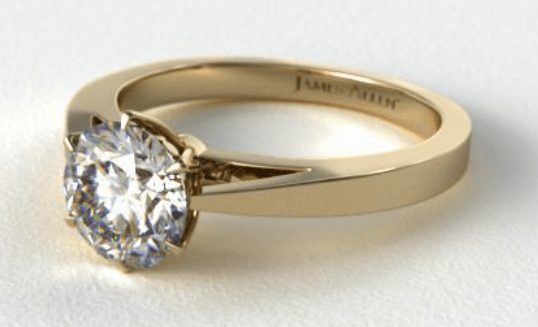 For round cut diamonds, any color grade from J – M will look great on a rose gold ring setting. Hi I have my mothers platinum diamond engagement ring which was probably bought in the 1940’s yesterday I noticed a shard of the platinum was sticking up on the band. 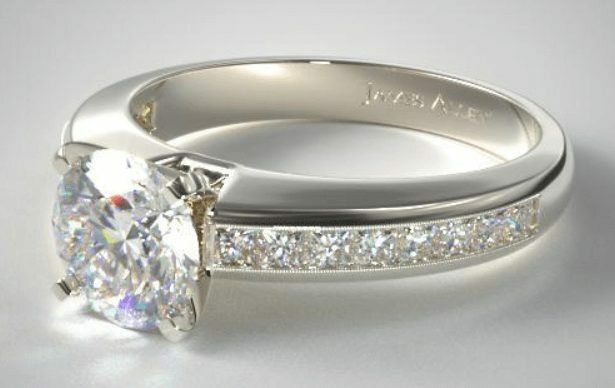 I haven’t caught it on anything and thought platinum was the strongest metal, I wear it with her platinum wedding ring. Do you know the cause and if it can be repaired without damaging the diamonds? I’m so upset as it was my dear mums pride and joy. I haven’t caught it on anything so cannot understand why it has gone like this. 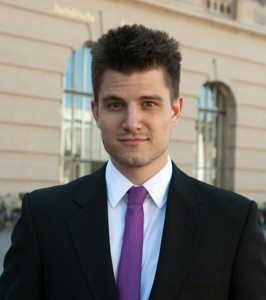 Would be pleased of any advice you can give me. Many thanks. Sorry to hear about your ring. Although platinum is a durable metal, it tends to get dull and build scratches over time. Therefore, a regular repolishing is required every few years. A shard of the platinum sticking up on the band is really rare indeed and usually it just happens when there is outside force applied. Anyway, you can go to a professional jeweler to have the ring repaired. It might be necessary to have the diamond removed, but that depends on the kind of concrete damage the ring has. This scenario is pretty normal given the age of the ring. Just have it checked by a reliable jeweler, so you can still enjoy your mother’s ring for many years to come!